TRAINING OBJECTIVES: This course provides a basic knowledge of liquid penetrant inspection sufficient to enable the graduate to carry out liquid penetrant inspection in accordance with established procedures under the supervision of Level 2 or Level 3 personnel. The practical work incorporated in the program will help the participant to develop self-confidence in processing components following written instructions and to be knowledgeable in the terminology associated with liquid penetrant inspection. 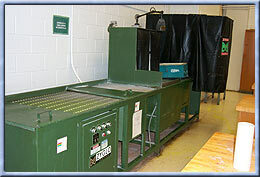 DEFINITION OF LEVEL 2 PERSONNEL (AS PER CGSB): Level 2 personnel are defined as personnel who will perform and/or direct Liquid Penetrant Testing according to established or recognized procedures and shall be responsible for the liquid penetrant method or technique to be used, and for the interpretation of the test results.